Two intriguing countries and one dramatic river equal a grand adventure. Before setting sail on the Douro River, experience three legendary Spanish cities: Salamanca, the lovely “Golden City”; Madrid, renowned for its museums, stately royal palace and vibrant nightlife; and Toledo, the city of El Greco and a magnificent tribute to the three great cultures that forged Spain. Cruise through the UNESCO-designated Douro Valley, where grapes have been grown for 2,000 years, visiting picturesque quintas and meeting the winemakers who operate them, as well as tasting the wine. Get even closer to natural treasures at the Douro International Natural Park, where you can get a better understanding of the flora and fauna of the land with an intimate boat cruise, and at the Quinta Aveleda’s gardens, offering an enchanting landscape that boasts a cascading waterfall, graceful swans swimming, peacocks flaunting their colours and so much more. Visit the walled village of Castelo Rodrigo, a site that dates back to the 12th century, and the pilgrimage town of Lamego to see the monumental baroque Sanctuary of Nossa Senhora dos Remédios. Travel through the verdant countryside to Óbidos, a charming hilltop town that has entranced visitors since the 13th century en route to Portugal’s colorful capital of Lisbon. Reward your inner explorer with the “Jewels of Spain, Portugal & the Douro River,” blending captivating cities, picturesque villages and unparalleled scenic cruising through this less-traveled corner of Europe. Save $2,200 per person on select 2019 voyages for a limited time. Waived or reduced the Single Supplement on a select number of 2019 itineraries and departures for guests eager to see the world solo. * All prices quoted are PER PERSON based on twin share in Australian Dollars and include taxes, fees and port expenses (if applicable). 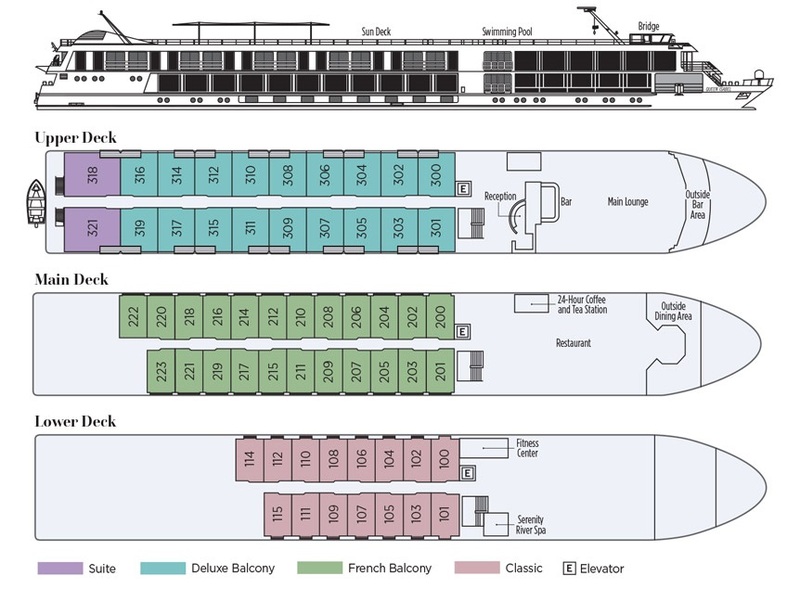 All prices quoted are for the cruise departing on 19Jul19. Certain departure dates and embarkation points may be at an additional supplement. For more information please contact one of our Travel Specialists. itineraries and departures for guests eager to see the world solo. Note: The itineraries presented are subject to modification due to water levels, closures because of public holidays or other uncontrollable factors. Every effort will be made to operate programs as planned, but changes may still be necessary throughout the cruise. This day-to-day schedule is subject to change. Your final day-to-day schedule will be provided onboard on the first day of your cruise. Everything old is new again in the Portuguese capital, which is undergoing a remarkable rebirth of late. Get to know this hilly metropolis with a city tour that shows you all the top sights and treats you to a unique pastry with an intriguing (and delicious) history. Dynamic, colorful and picturesque, Lisbon will continually surprise you. Glorious historic architecture reflects the wealth brought in during the “Age of Discovery,” when the Portuguese owned the seas, but it is also a modern center of finance and international trade. You’ll board a motorcoach this morning, heading north through Portugal’s picturesque countryside toward Porto—but you’ll stop in fascinating Óbidos before you reach the colorful city. The tiny whitewashed village of Óbidos is so charming that Portuguese kings traditionally gave it to their brides as a wedding gift. Need we say more? Climb up to the imposing hilltop castle for spectacular, Instagram-worthy photos of the countryside and the sea beyond. There’s much more to Portugal’s second city than its eponymous fortified wine—historic architecture, cutting-edge design, fabulous food and wine, and a hip, laid-back vibe. Discover its many charms with your choice of distinctively different tours today. Today you cruise to the mouth of the Douro and Portugal’s second city (after Lisbon), Porto, which gave its name to the nation’s most famous export, Port wine, and to the nation itself. The city is a fascinating combination of historic buildings and cutting-edge architecture, tradition and vivacious modernity. Guimarães or Porto? That’s the question of the day today (you really can’t go wrong either way). Guimarães is the town where Portugal was born and its well-preserved architecture and stylish young residents make it a pleasure to visit. Or opt to explore one of Porto’s oldest neighborhoods, picturesque Ribeira, considered the soul of the city. The family-owned Quinta da Aveleda looks like something out of a fairytale, with its lush flower gardens, peacocks and swans, shady terraces and whimsical follies—the perfect place to relax over a glass of vinho verde, the preferred drink of the region. After your visit to the quinta, you will get a crash course in the history of making Port during your visit to the Douro Museum. One of Portugal’s top pilgrimage sites is our destination today, Our Lady of Remedies in Lamego. The church sits high above the town, accessible via hundreds of zigzagging steps adorned with beautiful blue and white tiles. After seeing the sights with a local expert, enjoy a tasting of locally made wines at a picturesque quinta. Today is all about wine, which has been cultivated in the Douro River Valley since ancient Roman times. You’ll head to the hills to a prestigious wine estate, where you can sip Port while savoring marvelous views. Or, take a scenic drive to a family-owned quinta, where you’ll have a firsthand look at grape harvesting. 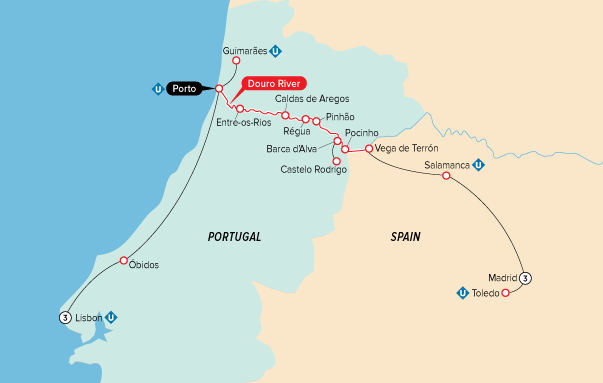 Whichever excursion you opt for, you’ll spend the afternoon cruising along a stretch of the Douro that is considered one of the most beautiful in all of Europe, boasting dramatic vistas, bountiful countryside and terraced vineyards, as well as picturesque villages tucked along the riverbanks. A tiny village surrounded by mountains, Barca d’Alva is your base for today’s adventures. Go medieval today at Castelo Rodrigo, both the name of a hilltop castle as well as the village that surrounds it. It has been singled out as one of Portugal’s 12 historic villages for its medieval beauty. The view from the top is incredible and the village is a charming place to ramble, relax and replenish. Or, if you wish, you can also lace up your hiking boots and unleash your inner Indiana Jones with an up-close gander at some prehistoric carvings during a visit to Portugal’s first archaeological park, Foz Côa. What adventures await you in Spain? You’ll disembark today, heading towards Madrid. Along the way you’ll visit the beautiful and historic university town of Salamanca—the “Golden City”—famous for its sand-colored buildings and abundance of churches. This is the university town where Columbus sought advice before sailing west in search of the new route to the Indies. Walk with a local expert through the Plaza Mayor, considered one of the most beautiful squares in Spain, and visit the university and the city’s astounding Food Hall. After checking into your hotel in Madrid, join a guided “Madrid at Your Doorstep” vicinity walk to begin getting acquainted with the city. Madrid may very well be Europe’s liveliest capital city, a place where people eat late and stay up even later. Get your bearings with a panoramic overview or a more intimate walking tour, both of which include a visit to the extraordinary Prado Museum. Tonight, enjoy dinner and a colorful, passionate, foot-stomping show at the city’s finest flamenco venue. The capital of Spain, Madrid boasts incomparable artwork, an amazing range of architectural styles— from Moorish to postmodern—and exceptional food. Your Iberian adventure begins here as you sample some of its highlights. A one-time ancient Roman colony, medieval Moorish capital and center for religious tolerance, Toledo is said to be Spain’s spiritual heart: a timeless, UNESCO-listed city where Muslims, Jews and Christians have peacefully co-existed for three centuries. After your city tour you’ll have time to explore—and eat—on your own; the food here is so exceptional that Toledo was named Spain’s gastronomic capital in 2016. You’ve experienced the best of Spain, Portugal and the pristine Douro River, but now the journey comes to a close. If your cruise/tour package includes a group departure transfer or if you have purchased a private departure transfer, you will be transferred to Madrid-Barajas Airport for your flight home. Your Uniworld adventure may be over, but we know you’ll enjoy the memories you’ve made for years to come. Beautifully appointed riverview suites (323 sq ft – 30 sq m) have full balconies, hotel beds draped in fine linens with choice of pillows, built-in closets, slippers, hair dryer, safe, individual thermostat, flat-screen television, radio, alarm clock, iPhone/iPod charger and player, Nespresso and tea station, bottled water, and fresh fruit daily. Bathrooms with L’Occitane en Provence bath and body products, plush towels, a choice of bathrobes, and slippers. Beautifully appointed riverview Deluxe Balcony Category 1 staterooms (215 sq ft – 20 sq m) have full balconies, hotel beds draped in fine linens with choice of pillows, built-in closets, hair dryer, safe, individual thermostat, flat-screen television, radio, alarm clock, iPhone/iPod charger and player, bottled water daily. Stateroom (161 sq ft – 15 sq m) amenities include French Balcony, built-in closets, hair dryer, safe, individual thermostat, flatscreen TV, radio, alarm clock, and bottled water. Bathroom amenities include L’Occitane en Provence bath and body products, plush towels, comfy bathrobes and slippers. Stateroom (161 sq ft – 15 sq m) amenities include built-in closets, hair dryer, safe, individual thermostat, flatscreen TV, radio, alarm clock, and bottled water. Uniworld’s Queen Isabel provides an up-close and unforgettable view of Portugal’s Douro River Valley—a designated UNESCO World Heritage Site—renowned for its dramatic, rugged scenery and pristine waters. Named after Portugal’s beloved queen, this boutique 116-passenger vessel is the most unique and stately ship on the Douro, a wonderful place to admire the region’s steeply terraced hillside vineyards and charming wine estates. Lavishly appointed riverview staterooms and suites have handcrafted Savoir® of England beds draped in high-thread count 100% Egyptian cotton sheets and European duvets, along with a menu of pillow options. Uniworld’s meticulously designed ships feature enticing public areas and luxurious amenities, including a lounge with full-service bar, well-equipped fitness center, restaurant, Serenity River Spa, and a Sun Deck where you can relax and take in the ever-changing views. Note: Cruising in Spain and Portugal is a wonderful experience, and while the Queen Isabel is a lovely and comfortable ship, its amenities may differ from those of a Uniworld company-owned ship. Butler service is not available on this ship.